Late author and screenwriter Ben Hecht wrote this account as part of an unfinished biography of Mickey Cohen in 1958-9. It is published here by permission of his widow, Rose Hecht. 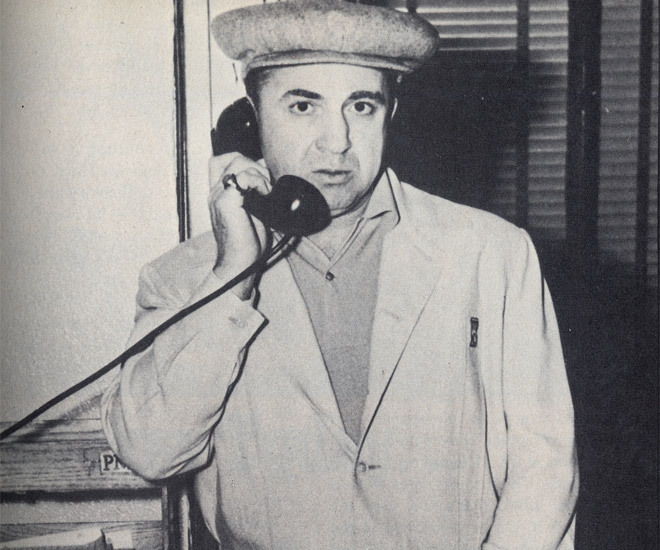 I am full of hair-raising information told me by an ex-underworld king-pin named Mickey Cohen. How he shot, slugged, gouged and swindled his way from rags to riches. How he preyed on society as a stick-up man and crooked gambler, how he corrupted its guardians and strutted for a long time in the nation’s headlines. In addition to facts, I have a knowledge of this disorderly man that may be a deep one. I feel I know him as well as I know Macbeth or the blonde Borgia. Looking on what I know about this rambunctious law-breaker and headbreaker, I find myself diverted, relaxed, even pleased by Mickey Cohen and his fie-fo-fum activities. They represent a certain sanity in a lunacy-whirling world -the sanity of the criminal. All other human matters change, grow complex and undecipherable-what is good, what is noble, what is pious, what is progressive. The criminal alone remains a constant. It is his pleasure to break laws and hold society in contempt. As he was in the tribal civilization of thirty thousand years ago, so he is in the civilization of, oil interests, hydrogen bombs, and the disintegration of human thought into political jabberwock. I am far from alone in my concept of the criminal as a relaxing bed-time story. He has been putting the U.S. happily to sleep since World War I. If not for the criminal and his endless bang-banging villainy on movie and television screens, in fiction and newspaper headlines, it is quite possible the U.S.A. would have had a nervous breakdown-or rather a worse one. Another engaging side of Mickey Cohen is that he is no product of “Our Times.” From a literary point of view this is a considerable virtue. He is not the victim of our economic or political system, or even its revoltee. He is, in fact, totally uncritical of these galaxies. The criminal has no hates or fears – except very personal ones. He is possibly the only human left in the world who looks lovingly on society. He does not hanker to fight it, reform it or even rationalize it. He wants only to rob it. He admires it as a hungry man might admire a roast pig with an apple in its mouth. He is the presocial part of us-the Ape that spurned a collar. The criminal in the time of his lawlessness is one of the few happy or contented men to be found among us. He has a blood lust, an exploding temper, a savage pleasure in breaking heads. But in a criminal his blood lust is business equipment. He uses it as naturally as a banker uses a frock coat. And if he has other neuroses than a need for bloodletting, these are equally untroublesome. He lives his primitive instincts (called neuroses by society) to the hilt. While he remains a criminal he is as free of conscience pangs as the most right-doing of bookkeepers. He eats well, sleeps well, lives well, and his only disadvantage is that he may die ahead of his time from an enemy bullet, the gas chamber or electric chair. When I was a newspaper reporter in Chicago, I saw a dozen men executed by hanging. Those of them who had been urged into murder by misplaced loves or accidental rages were usually numb with the terror of dying. It was otherwise with the authentic criminal. He usually faced death casually- as does the Ape. With these preliminary broodings out of the way, I feel more eager to investigate the brawling life of one of the Republic’s most colorful, and, for a long time, most successful criminals, Mr. Cohen. Mickey was born in Brooklyn, 1913, of immigrant and orthodox Russian Jewish parents. Four sisters and a brother awaited him. Two months later the father died and Ma Cohen parked four of her brood with relatives. With daughter Lillian at her side and Mickey in her arms she headed westward. She settled in Los Angeles and opened a small grocery store in Boyle Heights, the toughest and grittiest area of the city. Ma Cohen was a good and pious woman as Sam, her husband, had been a pious and kindly man. Her kin were equally God-fearing and law-obeying. Yet mysteriously out of this religion and honest family a criminal emerged. Mickey’s criminality began at the age of 3, long before environment could start shaping him . At that age he earned his first nickels as a newsstand helper. His duties were to sit on the stacks of newspapers, protecting them from the winds and grabbing hands of Boyle Heights. Becoming aware of the valuables he was pinning down, Mickey started swapping them, furtively, for candy and hot dogs. “I was really looking to make a buck at a very early age,” Mickey puts it. At the age of 7 he became a bootlegger, making gin in the rear of a drugstore and peddling it to a grateful clientele. A hundred street corner fights marked the next three years, during which Mickey became a fixture in the First Grade of the Cornwall Elementary School. His education collapsed in the Second Grade. He was to remain unable to read, write or count beyond five until in his twenties. At the age of 9 Mickey selected his career. He went on his first heist and held up the box office of the Columbia Theatre, using a cudgel as a persuader. This is one of the psychological curiosities presented by my subject’s story. He took to burglary and violence as a duckling takes to water. No Jewish morality, no family decency had touched his spirit. He launched his attack on society as if sired by a long line of pirates.